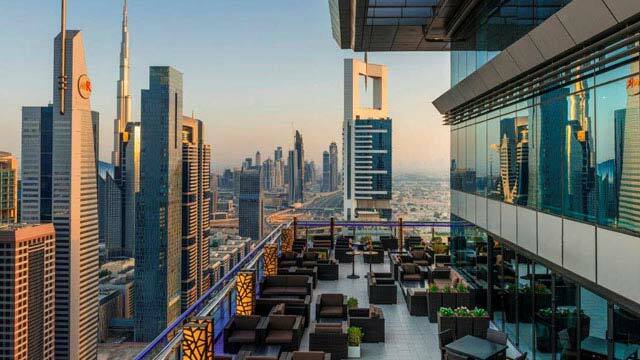 A complete guide to the 17 best rooftop bars in Dubai in 2019. The ultimate guide to the best roof terraces in Dubai. Complete list with all info you need about each place. Opening hours, dress code, pictures, maps and much more. Dubai is packed with high-rise skyscrapers, modern buildings and fancy restaurants. 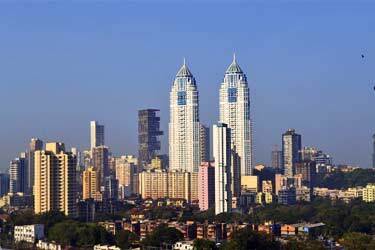 In other words – a perfect rooftop city. 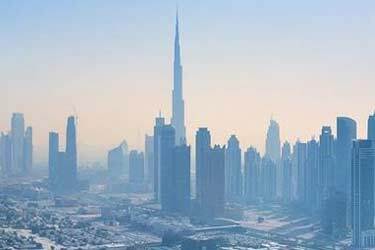 Which are the best rooftops in Dubai? 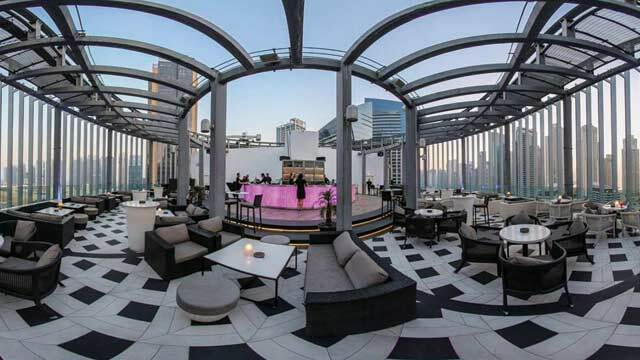 Just scroll down and find the Dubai rooftop bar best suited for you. Or use the Dubai rooftop map in the bottom right corner. 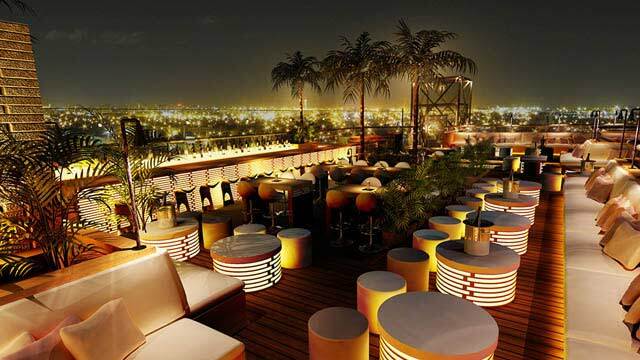 A very chic and trendy rooftop bar in Dubai with absolutely stunning views of the city and its surroundings. Considered one of the most exclusive spots in all of Dubai, so be prepared to spend a bit of money. But bottom line, it is well worth it. The bar offers a large drink menu with lots of premium bubbles, wines, spirits and cretaive cocktails along with a great selection of fresh and tasty food. Expect great service and a vibrant atmosphere in a stylish setting. Plus Friday rooftop brunch and live music two nights a week. 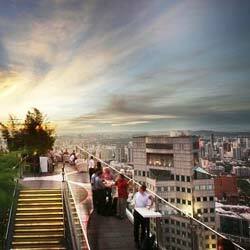 A magnificent open air terrace, located 155 meters above ground. From up here you get a magical 360-degree view of the entire Dubai amid the skyscrapers in the city center. 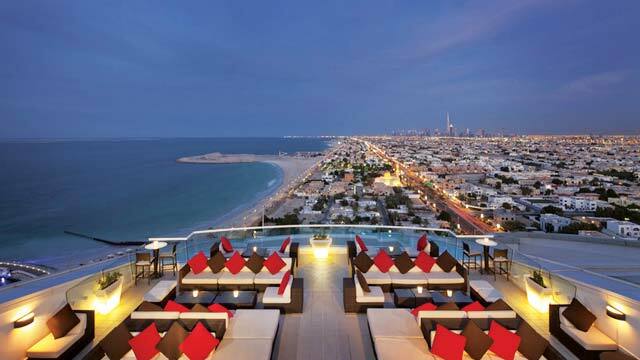 Grand views over all the famous monuments along with sunset views over the Jumeirah coastline. Quite large and very stylish terrace with a lot of lounge furniture, along with a smaller indoor lounge with a cool bar. The menu at the rooftop offers a wide selection of both drinks and food, from the Level 43 Lobster Slider to a large set of signature cocktails. Popular place but still with a cool, calm and classy vibe. Located on the 35th floor of the Hilton Dubai The Walk, this classic white and chic rooftop bar offers a great view over the Palm Jumeirah and the Arabian Gulf. Both a restaurant and a lounge terrace, where you can enjoy fine á la carte and set menus along with tasty bar bites and crafted signature cocktails, especially some very creative signature martinis. 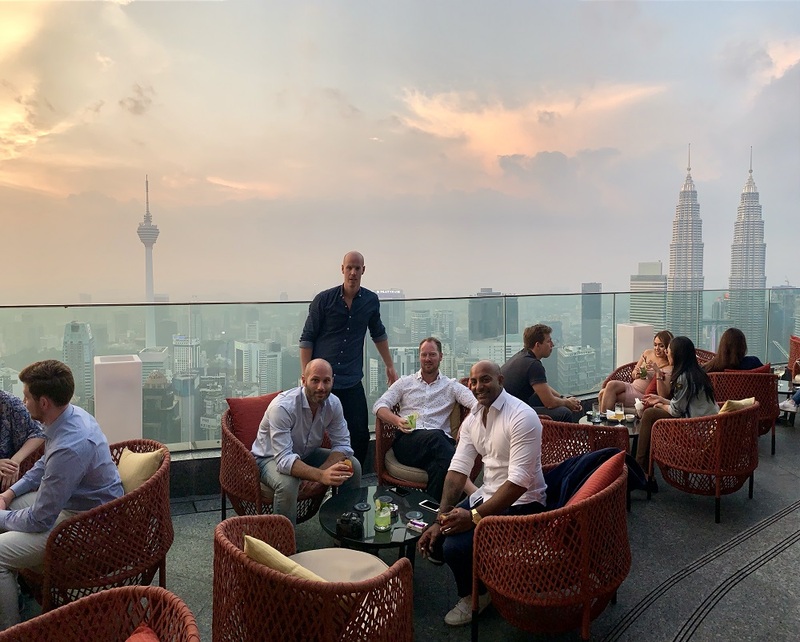 Perfect rooftop to visit around sunset for Sunset Happy Hour, relaxing cocktails and the absolutely best views and later at night for more trendy party vibes. Estrellas Rooftop Lounge is a pool bar & lounge located on the 7th floor of Meliá Hotel Dubai, a little bit outside downtown Dubai. The terrace offers stylish furniture, lounge sofas, a great rooftop swimming pool and an outstanding panoramic view of Dubai's skyline. From the extensive bar menu you can order stuff like burger, curry, BBQ grill and contemporary cocktails, all at very human prices. There is also a nice selection for the sisha-lovers. Usually there is quite a vibe at the terrace, with different nightly events. Tomo - which means "longtime friend" - is both a fantastic rooftop bar and a Japanese restaurant of the highest class. Located at the 17th floor of Raffles Hotel in the older part of Dubai, this is the place to catch the most amazing views of the "new" skyline. If you manage to make it a sunset you are in for a treat of a lifetime. With great service, an open, airy and stylish terrace, a large selection of some of Dubai's best Japanese dishes and a rooftop bar serving a wide variety of Sake, Shochu and sophisticated cocktails, Tomo is really a 'must visit'. One of Dubai's most stylish and luxurious rooftop terraces, with plenty of seatings and equipped with a big swimming pool, beautiful sundowners, cabanas and regular tables. Located at hotel Grosvenor House in Dubai Marina, and working as outdoor lounge to the famous Buddha-Bar. Not at all the highest rooftop in Dubai, but the 360-view from the terrace is still superb. Siddharta Lounge works as both restaurant, lounge and bar, with Mediterranean / Asian cuisine, creative and delicious cocktails along with a wide range of sisha. Expect great vibes and quite a crowd. 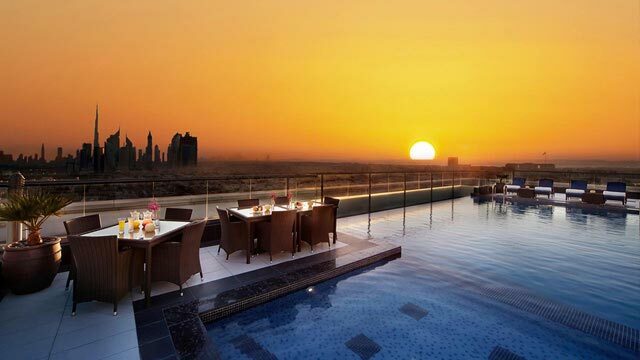 Dive into our list of the very best rooftop pools in Dubai. 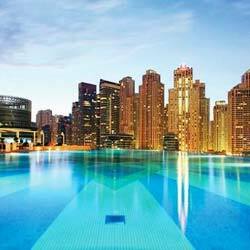 Amazing swimming pools with dazzling city views, you don't want to miss out on this when visiting Dubai! 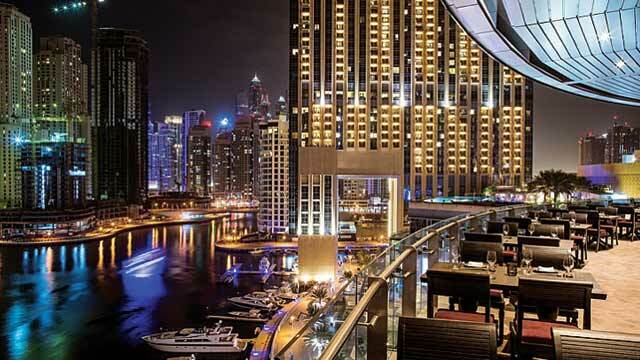 A chill-out rooftop terrace, located at the 5-star luxurious hotel Address Dubai Marina. Only situated on the 4th floor, but this large and airy terrace still offers majestic views over the marina. Equipped with a fantastic infinity pool, open for hotel guests but also to non-guests for a fee. So poolside lounge during day, and restaurant / rooftop lounge at night, when you can enjoy a wide range of great signature cocktails, along with cuisine from Mediterranean to the Far East. Expect great service and a vibrant but sophisticated atmosphere. Classic rooftop cocktail lounge right in the heart of Dubai, located at the 8th floor at Radisson Blu Dubai Media City. The open air terrace offers great views over Media City and across to the sea, and has a bar / dancefloor section along with a more comfy lounge seating area and in summer an air-conditioned rooftop tent. Come early for relaxing sunset vibes and enjoy the creative and well made specialty cocktails. Later at night this is a popular after work terrace with a festive atmosphere and a large crowd enjoying live bands and DJs well into the wee hours. Atelier M is really a venue for a full night. Covering the top three floors of Pier7 in Dubai Marina, this is both a restaurant, indoor lounge and rooftop bar. So whatever the mood and whatever the weather, Atelier M most likely will have something to offer. Go for fine Mediterranean cuisine with Asian influences at the restaurant terrace or enjoy bar-style food, mixology cocktails, high atmosphere and lots of events at the rooftop and lounge. All to sweeping views of the Dubai Marina. Uptown Bar is a relaxed and sophisticated Dubai rooftop bar, located on the 24th floor of the 5-star luxury Jumeirah Beach Hotel. If you are looking for fantastic ocean views (with Burj Al Arab as add on), look no further! The open and airy terrace is equipped with some very cosy lounge sofas, and works on a first come, first served basis. Enjoy first class drinks, created by experienced mixologists, along with light tapas. Usually a very nice buzz at the rooftop, however still at a chilled level and just some background music to go with the conversations. Located just off Dubai Marina you find the One&Only Royal Mirage Resort and their a bit different rooftop bar, at least compared to other "classic" Dubai rooftops. With a round bar inside showing live sports, the outside open terrace is one of the more romantic, calm and cosy found in the city. Decorated in arabic style with embroidered cushions in the lounge sofas, mosaic tables and candles doing most of the lighting. 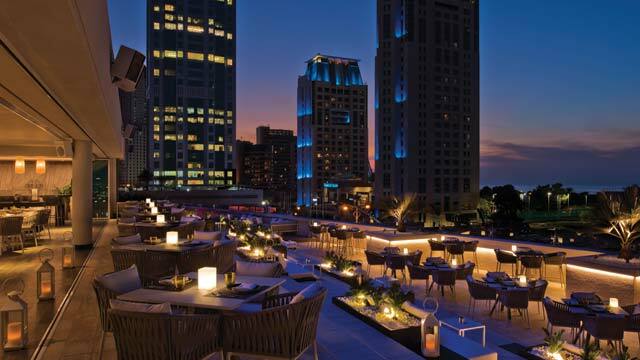 From the rooftop bar you can order champagne, wines, classic cocktails, craft beer and a selection of Arabic mezzehs to enjoy with the panoramic ocean views. 40 Kong rooftop bar is a very chic and trendy cocktail lounge and restaurant, located at the H Hotel Dubai. With nightly events dedicated to hip-hop, live DJs and local artists, this is really where the trendy crowd of Dubai enjoy great music and dance the night away. The modern and stylish terrace recently put up glass walls and a retractable roof, which is a bit damaging for the views, but alot more weather safe. Enjoy a classy dinner with International cuisine, and then stick around to experience sky high vibes at one of Dubai's trendiest places. A cozy, luxurious and award-winning rooftop bar and restaurant in Dubai. Asian-inspired decor, with a really cool inside bar and a stylish terrace shaped as a large balcony offering some real lovely views over the Dubai Marina. Enjoy a mix of Pan-Asian specialties along with amazing Asian-inspired and creative cocktails. Elegant and upbeat vibe, great service and events like sax player every Thursday makes this a higly popular rooftop bar, well worth a visit. 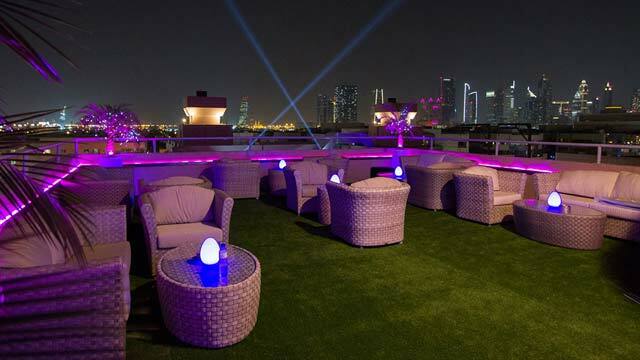 One of the very best rooftop terraces outside of downtown Dubai. Up on the 19th floor you get amazing 360-views in all directions, towards the new skyline and also over old Dubai. Only open to hotel guests, this rooftop is really a private oasis with one of the best rooftop pools Dubai has to offer. Equipped with luxurious sun loungers along with some regualar tables where you can enjoy lunch and poolside drinks to the grand views. 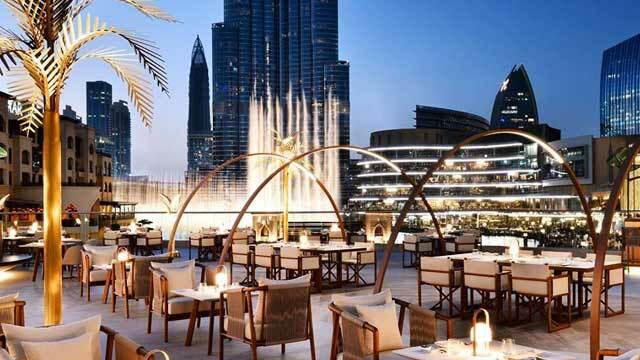 Located on the 6th floor of Mercure Gold Hotel, in between old and new Dubai, this is the rooftop to visit if you want to enjoy tasty Indian food and shisha along with cool views of the Dubai skyline. Not as fancy as many other rooftops in the city, but with more focus on a relaxed and fun atmosphere, good music and reasonable prices. Enjoy spicy kebabs and Indian pots along with all the classic drinks, or let the live DJ take you all the way up dancing. Either way you are most likely in for a fun and unpretentious night. This amazing rooftop bar and terrace, called Mosaic Pool & Lounge, comes with three great features: an incredibly luxurious decor, a really cool close up views of Burj Khalifa and an amazing rooftop infinity pool. The pool is open to hotel guests but also to non-residents for a fee. Serving as a pool lounge by day, the rooftop bar offers a wide set of different cocktails (like frozen and sparkling) along with classic pool food. Then at night the terrace transforms into a trendy Arabic lounge, serving cocktails and Lebanese cusine. 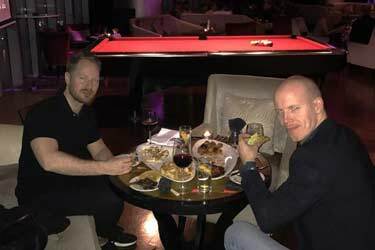 A five star luxury hotel where you find both a fancy skybar called Neos on the 63rd floor and a rooftop bar & restaurant on the 5th floor called Zeta. Fantastic views over Burj Khalifa and downtown Dubai from both venues, where Neos is a luxurious indoor skybar, offering exclusive interior, a sophisticated ambience, along with delicious bites and premium cocktails. 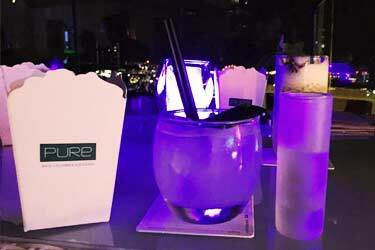 Zeta serves great food with inspiration from Asia and California, and the open-air roof terrace is perfect for dinner with a view over Burj Khalifa and the fountain show. 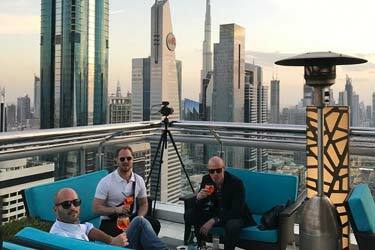 In Dubai there are lots of good and luxurious rooftop bars where many of them also are some of the best lounges in the city. 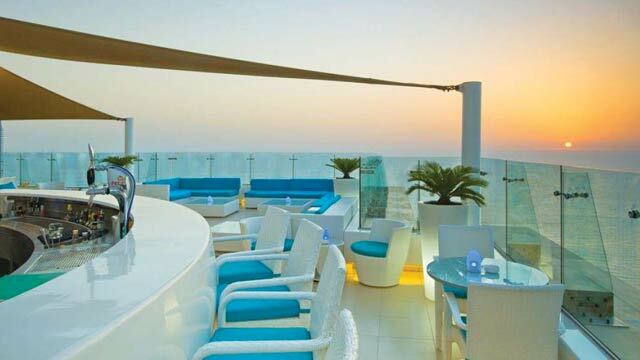 Almost all Dubai sky lounges has a magical view and a very luxurious and stylish furnishing. Prices are, unfortunately, quite juicy, but the quality and service make up for it. Regarding the pace the city build in, new skyscrapers and hotels pops up all the time - resulting in new rooftops. 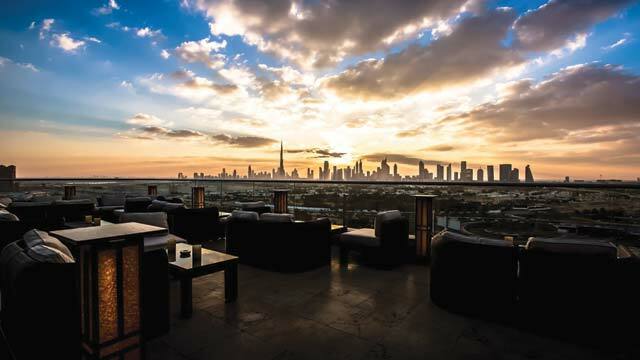 Most rooftop bars in Dubai are within easy reach of each other. 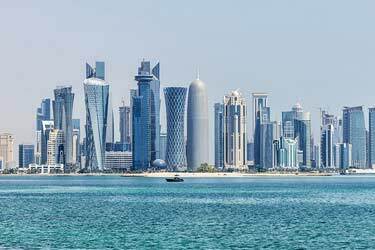 Some are located down in the center with city views, some are at the beach and Jumeriah, and a few little outside the city center. A typical Dubai terrace is located at a luxurious hotel with fancy city views. 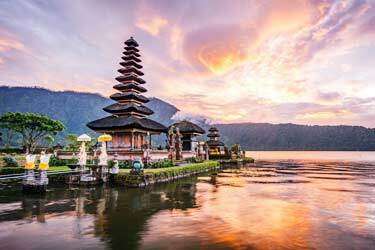 What are you waiting for, get out there and search for the best places to drink with a view, and you will have a great time when visiting this amazing city. Dubai is the UAE's largest city. ¾ of all inhabitants here are men due to the large number of male migrant workers. 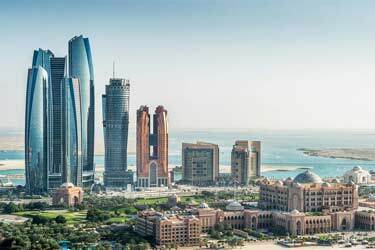 Unlike many other cities in the country Dubai has a more open attitude to foreign customs and the supply of pleasure, entertainment and other attractions are extensive. Among other things, the city of Dubai allow serving and purchasing of alcohol. 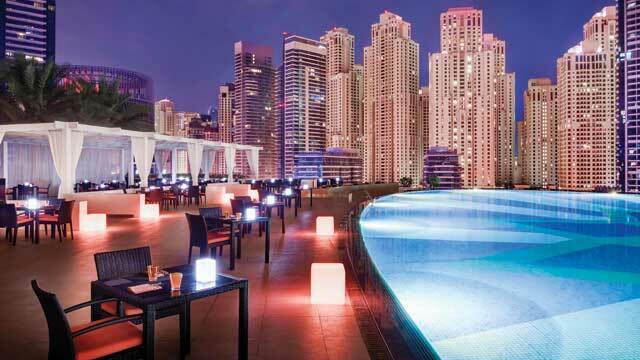 Most rooftop bars in Dubai are very luxurious with both the food and drinks of very high quality. On the roof terraces here, you can eat amazing Japanese tapas, traditional bar meals and fine tasting menus. 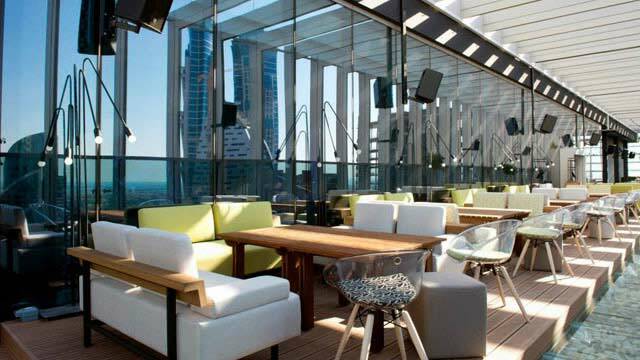 Choose among the wide range of rooftop bars in Dubai and find your favorite in terms of food. Regarding drinks most are quiet similar. 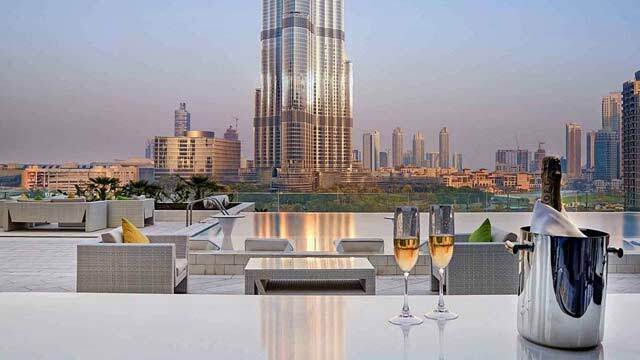 Classic cocktails, fine wines and champagne are frequent on roof terraces in Dubai. For those who like to party, there are some very good spots to hang out at. 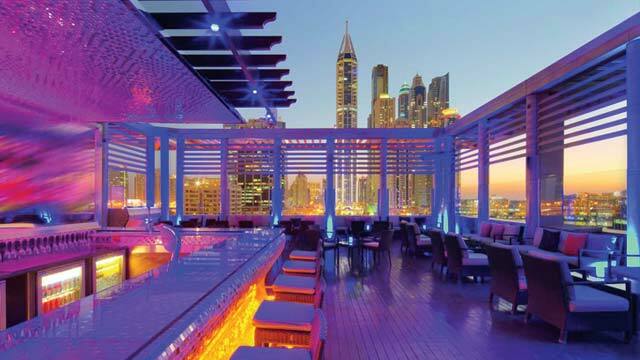 On many of Dubai’s rooftop bars you can party in style all night. The parties on the terraces are often in very luxurious style, but there are also a little more casual places. If you want to experience Dubai at high altitude and get a grand overview of the city, the perfect way is to visit one of Dubai's rooftop terraces. 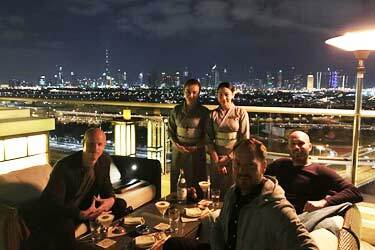 Some of the rooftop bars in Dubai overlooks the city center, a part of the Arabian Gulf and some a bit outside the city center with views of skyscrapers skyline. Given that all the towering skyscrapers being built here, the rooftop bars in Dubai are on very high level - both in the city and outside. 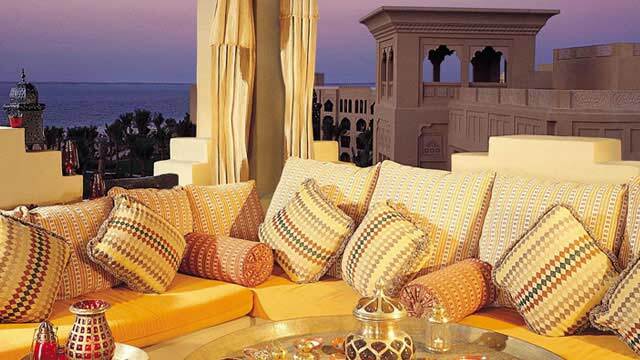 Regarding the views and heights from the roof terrace of Dubai, there is something for everyone. Mightiest are almost those who have both sea and city views with a 360-degree angle. You must check out this website if you're looking for Dubai video guides. Amazing content! There are lots of things to do in Dubai, in addition to visiting the city’s rooftop bars. Or what do you say about the desert safari on a quad bike followed by surfing on the sand dunes, lie and lounging in a deck chair at one of Dubai's beaches, visit one of the city's gigantic shopping malls, stroll around the Dubai Marina or why not visit the world's tallest building Burj Khalifa. Here you can keep yourself occupied indefinitely. Dubai - one of the world's most luxurious and most modern cities. Obviously there are lots of good rooftop swimming pools here. 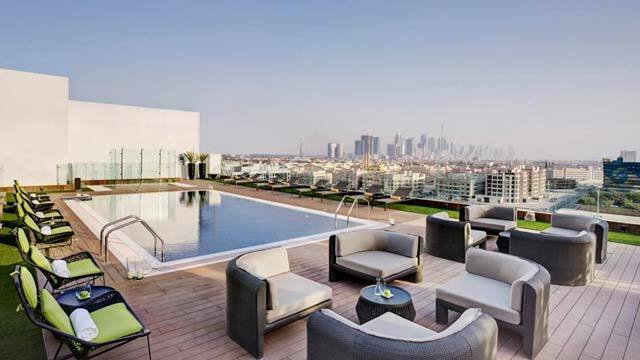 Like everything else in Dubai the rooftop pools are also an in luxurious and modern style. Almost all rooftop swimming pools in Dubai has a great view of the city skyline and among the skyscrapers. Some also have beautiful sea views. 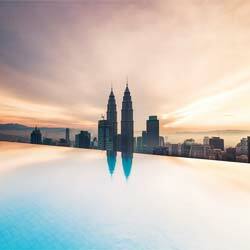 To use any of the city's rooftop swimming pools, you need to book a room at the hotels that own these pools. The easiest way is to book directly with us. Here you can also find the best rates and deals for hotels in Dubai. Do not miss to experience the luxury of swimming in a rooftop pool while you gaze out over Dubai's towering buildings.